Satish Kaushik's latest offering Tere Naam is the remake of the South hit Sethu and is an ‘unfortunate love story’ of an obsessed guy and a simple girl. 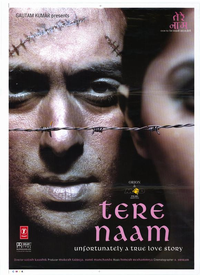 The day before I went to see the Salman Khan-starrer Tere Naam, I attended a press meet at which Salman addressed the audience. I had never met the actor before. For campus loafer Radhe Mohan life's all about having the weirdest hairstyle in Uttar Pradesh smoking like a chimney getting into street brawls and ragging girls. But when he encounters simple 'n' sweet Nirjara he tries to change. We often hear, "it's different", and especially in Bollywood its used and misused quite frequently.